The California Institute of Technology (Caltech) has been rated the world's number one university in the 2011–2012 Times Higher Education global ranking of the top 200 universities, displacing Harvard University from the top spot for the first time in the survey's eight-year history. 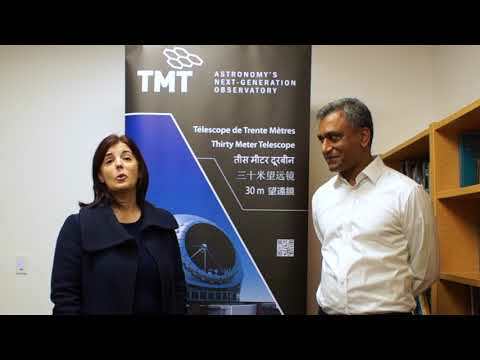 Caltech is a founding partner in the TMT project. Caltech was number two in the 2010–2011 ranking; Harvard and Stanford University share the second spot in the 2011–2012 survey, while the University of Oxford and Princeton University round out the top five. "It's gratifying to be recognized for the work we do here and the impact it has—both on our students and on the global community," says Caltech president Jean-Lou Chameau. "Today's announcement reinforces Caltech's legacy of innovation, and our unwavering dedication to giving our extraordinary people the environment and resources with which to pursue their best ideas. It's also truly gratifying to see three California schools—including my alma mater, Stanford—in the top ten." Thirteen performance indicators representing research (worth 30% of a school's overall ranking score), teaching (30%), citations (30%), international outlook (which includes the total numbers of international students and faculty and the ratio of scholarly papers with international collaborators; 7.5%), and industry income (a measure of innovation; 2.5%) are included in the data. Among the measures included are a reputation survey of 17,500 academics; institutional, industry, and faculty research income; and an analysis of 50 million scholarly papers to determine the average number of citations per scholarly paper, a measure of research impact. "We know that innovation is the driver of the global economy, and is especially important during times of economic volatility," says Kent Kresa, chairman of the Caltech Board of Trustees. "I am pleased that Caltech is being recognized for its leadership and impact; this just confirms what many of us have known for a long time about this extraordinary place." "Caltech has been one of California's best-kept secrets for a long time," says Caltech trustee Narendra Gupta. "But I think the secret is out!" Times Higher Education, which compiled the listing using data supplied by Thomson Reuters, reports that this year's methodology was refined to ensure that universities with particular strength in the arts, humanities, and social sciences are placed on a more equal footing with those with a specialty in science subjects. Caltech—described in a Times Higher Education press release as "much younger, smaller, and specialised" than Harvard—was nevertheless ranked the highest based on their metrics. According to Phil Baty, editor of the Times Higher Education World University Rankings, "the differences at the top of the university rankings are miniscule, but Caltech just pips Harvard with marginally better scores for 'research—volume, income, and reputation,' research influence, and the income it attracts from industry. With differentials so slight, a simple factor plays a decisive role in determining rank order: money." "Harvard reported funding increases similar in proportion to other institutions, whereas Caltech reported a steep rise (16%) in research funding and an increase in total institutional income," Baty says. Data for the Times Higher Education's World University Rankings was provided by Thomson Reuters from its Global Institutional Profiles Project (http://science.thomsonreuters.com/globalprofilesproject/), an ongoing, multistage process to collect and validate factual data about academic institutional performance across a variety of aspects and multiple disciplines. For a full list of the world's top 200 schools and all of the performance indicators, go to http://www.timeshighereducation.co.uk/world-university-rankings/. The California Institute of Technology (Caltech) is a small, private university in Pasadena that conducts instruction and research in science and engineering, with a student body of about 900 undergraduates and 1,200 graduate students. Recognized for its outstanding faculty, including several Nobel laureates, and such renowned off-campus facilities as the Jet Propulsion Laboratory, the W. M. Keck Observatory, and the Palomar Observatory, Caltech is one of the world’s preeminent research centers.